a device that changes the spectral composition and the energy of optical radiation (light) incident upon the device. The performance of a light filter can be indicated by plotting its transmission factor (transmittance) τ or its optical density D = – log τ against the frequency or wavelength of the radiation. Selective light filters are designed to absorb or isolate certain parts of the spectrum. When used with an optical detector, such a filter alters the spectral sensitivity of the detector. Neutral density filters, on the other hand, attenuate more or less uniformly the radiation flux throughout a certain region of the spectrum. The action of a light filter can be based on any optical phenomenon that exhibits spectral selectivity. Thus, an absorption filter makes use of the absorption of light. Examples of other types are reflection, interference, and dispersion filters. Glass absorption filters are most widely used. They exhibit constancy of spectral characteristics, are resistant to the effects of light and temperature, and have a high degree of optical homogeneity. More than 100 types of colored glasses are produced by industry for use in light filters. The spectral transmission curves of several colored glasses are shown in Figure 1. Light filters with different spectral properties can be obtained by using one, two, or, sometimes, three glasses and by varying the thickness of the glasses. Absorption filters made of dyed gelatin or other organic materials are used less often because the mechanical strength and thermal stability of such materials are low and because such materials fade in a rather short time. Filters of this type have two advantages: a great variety of spectral characteristics and simplicity of manufacture. Liquid absorption filters are used comparatively infrequently. Their advantages are that the filters can be made under laboratory conditions and that the filter characteristics change in a smooth manner when the concentrations of the components of the solution are changed. Gas absorption filters are used in some cases—for example, to isolate the ultraviolet region of the spectrum. Semiconductor filters are sometimes used in the infrared region of the spectrum, where they exhibit sharp transmission cutoff edges. Selective and neutral density reflection filters are made by depositing a metallic film on a substrate made of quartz or glass. Selective reflection filters with different reflection curves can also be obtained by combining layers of different thicknesses in multilayer dielectric mirrors (seeMIRROR and OPTICS OF THIN FILMS). Figure 2. Schematic of a simple interference filter. Between two thin layers of silver that serve as semitransparent mirrors there is sandwiched a dielectric layer whose optical thickness is λ/2, where λ is the wavelength of peak transmission. The filter is contained between two glass plates, which protect it from damage and provide ease of handling. An example of an interference filter is shown schematically in Figure 2. Such a filter consists of two semitransparent mirrors, such as layers of silver, between which a dielectric layer is sandwiched. The optical thickness of the dielectric layer can be λ/2, λ, 3λ/2, and so on, where λ is the wavelength of peak transmission. In transmitted light, the light waves that pass directly through the filter interfere with the waves reflected 2, 4, 6 or more times by the semitransparent layers. In reflected light, waves reflected 1, 3, 5 or more times interfere. As a result, in transmitted light there remain the waves whose wavelength is equal to twice the thickness of the dielectric layer; these waves are absent in reflected light. 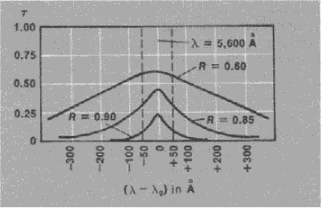 Transmission curves for such filters are shown in Figure 3. Interference filters can isolate regions of the spectrum as narrow as 15–20 angstrom (Å) with smaller light losses than absorption filters exhibit. The drawbacks of interference filters are the considerable off-peak transmission outside the passbands and the dependence of the location of the bands on the angle of incidence of the light rays. Birefringent filters make use of the interference of polarized beams. They can isolate extremely narrow spectral regions—as narrow as fractions of an angstrom—with a total absence of off-peak transmission. Such filters, however, are generally used only in astrophysical investigations, since they are complicated optical systems and are very sensitive to temperature and other external effects. In dispersion filters (usually called Christiansen filters in English), the peak transmission (minimum reflection) occurs at the wavelength λ0 for which the refractive indexes n1 and n2 of the two media in the filter are equal. As the spectral distance from λ0 becomes greater, the difference between n1 and n2 increases, and the transmission decreases. The isolation of the desired region of the spectrum is more efficient if the substance with the refractive index n2 is crushed before being immersed in the substance with the refractive index n1. Such a filter usually consists of small transparent glass particles immersed in an organic liquid. The peak wavelength can be changed by changing the refractive index of the liquid. A change in λ0 also results when the temperature is changed. Because of their high sensitivity to temperature, dispersion filters must be thermostatically controlled. For this reason, their use is limited. Figure 3. Transmission curves of interference filters with semitransparent silver mirrors for various values of the reflection coefficient R of the silver layers: (τ) transmission factor. The peak transmission is at the wavelength λ0 = 5,600 Å (560 nm). Light filters are used to isolate or suppress a required region of the spectrum in scientific investigations, in photometry, spectrophotometry, and colorimetry. They are components of almost all optical and spectroscopic instruments. In photography and cinematography, filters are used to reduce the effects of the scattering of light by haze and to improve the reproduction of colors and of light and shadow; they are also used for infrared photography. In illuminating engineering, they are used in signaling, in colored lighting, and to change the color temperature of light sources. Light filters are required whenever the heating effects of infrared radiation or the photochemical and other effects of ultraviolet radiation must be avoided. Filters are necessary when the spectral composition of visible radiation must be changed, or the radiation must be attenuated. For this reason, filters are the principal component of many protective eyeglasses. Infrared, ultraviolet, and fluorescence microscopy would be impossible without light filters. These examples do not exhaust the extreme diversity of the areas in which light filters are used. Zaidel’, A. N., G. V. Ostrovskaia, and Iu. I. Ostrovskii. Tekhnika i praktikaspektroskopii. Moscow, 1972. Baranov, S. S., S. V. Khludov, and E. V. Shpol’skii. Atlas spektrov propuskaniia prozrachnykh okrashennykh plenok. Moscow-Leningrad, 1948. Opticheskie materialy dlia infrakrasnoi tekhniki. Moscow, 1965. Krylova, T. N. Al’bom spektral’nykh krivykh koeffitsientov otrazheniia tonkikh nepogloshchaiushchikh sloev na poverkhnosti stekla. Leningrad, 1956. Rozenberg, G. V. Optika tonkosloinykhpokrytii. Moscow, 1958. A device for changing the magnitude and/or the spectral composition of the radiant light flux which is transmitted through it; designated as selective (colored) or neutral, according to whether or not the spectral distribution of the incident flux is altered. The black filter for silver inks and the yellow filter for gold bronze inks yields the best results in terms of which colored filter to use, but the addition of a polarized light filter was tested in order to determine if more accurate results were obtained. During such transits, the star's light filters through the atmosphere. Buses trying to turn right into James Street are now totally clogging the road because no bright spark has thought to extend the time the traffic light filter is in operation. T-Lite is a transparent ultraviolet light filter manufactured by Sakai Chemical of Japan, and is compatible and stable in various oils. In addition, it has an integrated light filter so it can be used outdoors. And new traffic light filter systems and roads are being added to make it easier to get to the site off Clifford Bridge Road. The unit also features an integral ambient light filter and guaranteed performance over the -25 C to +85 C temperature range. When Coronado announced its Better White Light Filter (BWLF), I wasn't the only solarphile at Sky & Telescope who wondered if it would displace the Baader filter as the new standard for white-light observing. Micron Filter, Sediment Filter, Pre-Carbon Filter Ultra Filter(Uv), Uv Light Filter, 4 Stage Mineral Cartridge, Total 6 Stage Purification, Full Stainless Steel Body (Universal Aqua Technologies) Or Its Equivalent To Isi Standard. Delicate striations of light filter through the partially glazed sloping roof of the cylinder.